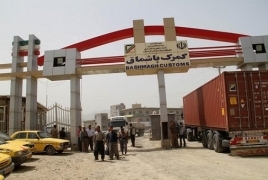 Trade continued to flow over the border between Iraq and Iran at the Beshmakh crossing in Iraq’s eastern Sulaymaniyah governate on Thursday, despite recently reintroduced U.S. sanctions on the Islamic Republic, Al-Masdar news says citing a report from Ruptly. The U.S. reinstated all the sanctions it had previously lifted as part of the Joint Comprehensive Plan of Action (JCPOA), or Iran nuclear deal, on Monday. The sanctions target Iran’s oil, banking and shipping industries and the Trump administration has also promised to institute harsh penalties for any other states that continue to conduct trade with the country.